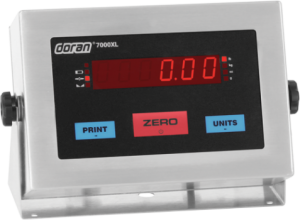 Doran has been manufacturing digital scales for forty years. This milestone was a great reason for them to take a look at their indicator lineup and make some adjustments. One of the biggest changes is a focus on Made in the USA quality. They have actually been able to source many more of their components from USA sources. In fact, according to Doran, if you buy a 7000XL with a 10″x10″ base and column, all products in that build were sourced from USA vendors. That’s pretty impressive in today’s competitive environment. Another change that Doran has made is to replace the 8000XL bench scale and digital weight indicator. Actually, this is not a surprise since the only real difference between the 7000XL and the 8000XL was a battery. So if you were a fan of the 8000XL scale or the 8000XLM digital indicator, then all you need to do is order a 7000XL with optional battery. Doran challenged the design team to update the indicator line. Doran’s engineers have been working overtime to update our indicator line starting with the 7000XL and 8000XL. Not only that, the purchasing department found ways to bring many items back to the USA. Doran is proud to announce that they will be building many of their products in their plant in Batavia, IL again. They are sourcing metal including indicators, columns and most platforms from superior stainless steel producers in the USA. Touchpanels and boards also come from USA sources. When you buy a 7000XL with a 10×10 base and column, know that all components were sourced from USA vendors. As they transition products back to the USA, Doran will be labeling products that are built in the US factory and USA sourced components with Built in America label that you see in this blog post. Along with USA manufacture, Doran has made some additional improvements as well. 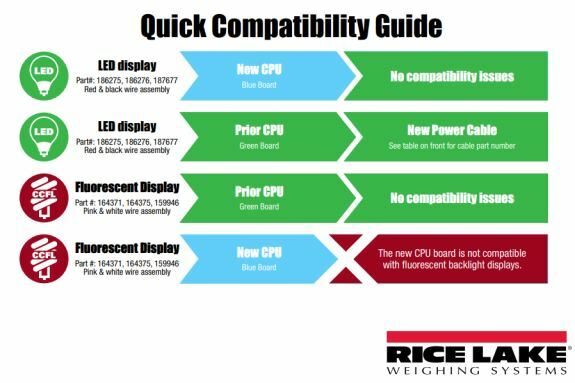 They are excited to introduce improvements like the 7000XL display, which is now 0.8” tall and expanded options. The factory now supports 34 options for the 7000XL weight indicator. It’s no mystery why so many people turn to the Doran 7000XL for their weighing applications. 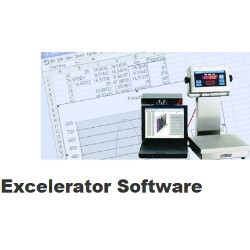 From capturing plant floor data to a simple dough scale on a baker’s bench, the 7000XL is adaptable to fit your specific needs. Engineered to stand up to the harshest environment, the sealed, heavy duty “Guardian” touch panel resists moisture and puncture damage. The big, bright red LED display is easy to read. IP69K rated Washdown safe, stainless steel is a hallmark of Doran Scales. The heavy gauge 304 stainless steel construction and the gasketed enclosure ensure that the 7000XL will provide many years of trouble-free service. Choose from a variety of Doran 7000XL models that include columns and attachment brackets to place the weight indicator at an ideal height for your weighing application. Need battery power? Just add option EXOPT308 and you have what used to be called the “8000XL” indicator. A couple of additional notes to consider about the Doran product line. The 7000XL display is now 0.8″ tall and the indicator now has thirty four options available. One thing that hasn’t changed is the washdown quality and stainless steel construction. So, if you need a scale for food processing environments with grease and debris clean up is needed, this is your scale. The 7000XL is ideal for washdown situations in food processing plants, dairies, packing houses, bottling plants, breweries, canneries, creameries and much more. So when it comes to stainless steel washdown bench scales, we usually recommend Doran Scales. In fact, we have received “Top Doran Scales Dealer” awards in the past. Contact our sales team (919) 776-7737 for additional information and price quotes. There’s all kind of cliche’s that come to mind with the new Cardinal 201 like good things come in small packages. That is definitely the case for this new item from Cardinal Scale. 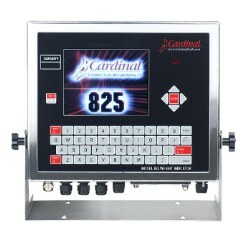 The Cardinal Scale model 201 weight transmitter is a fast, accurate instrument for process control-based static and dynamic weighing applications. The 201 is capable of powering up to (8) 350 ohm load cells and comes with a 35-mm DIN rail mounting bracket. The Made In The USA 201 transmitter built by Cardinal Scale out of Webb City, Missouri features a 0.5-inch-high, six-digit, transflective LCD display with up to (7) different colors and is viewable in all lighting levels from direct light to total darkness. A variety of mounting options and ColorZONE control options make it ideal for quick visual verification of weight status. 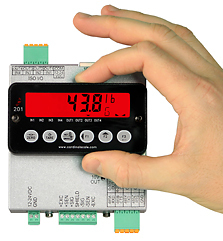 The Cardinal Scale model 201 weight indicator offers sample rates of up to 200 samples per second and standard communication protocols include serial interface RS232/RS485, mini USB-B, Analog (0-10V or 4-20mA), Ethernet TCP/IP, EIP, and Modbus TCP, making it easy to connect to a PC, PLC, and other smart devices. Four programmable digital inputs and outputs are included to make it even more flexible. Connectivity set-up is simple using the printed legend on the front of the 201 enclosure. Setup and calibration of the model 201 weight controller is fast and easy using both the on-screen indicator menu prompts or Web browser interface via IP address. The 4-in W x 4.2-in H x 1.9-in D compact size uses very little panel space, and the enclosure can be DIN rail mounted with the display either internal or remotely mounted on the face of the cabinet making it easy to implement into new and existing systems. The 201 weight indicator is both NTEP and Measurement Canada certified for legal-for-trade applications and is UL listed and CE certified. 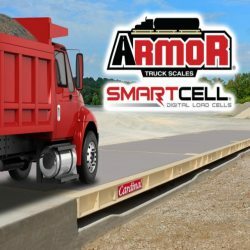 Cardinal Scale Manufacturing Company has with an extensive product line of scales and weighing systems complete with a wide selection of peripheral equipment for your truck scale or weighing operation. Cardinal’s customer service and technical support center is all located at the factory headquarters in Webb City, MO. When you buy your Cardinal Scale from Central Carolina Scale you’re not just buying a high-quality Made In America product — you are also putting Americans to work.